Want to be the best kisser they have ever had? Here’s how it’s done right! You may not be someone’s first kiss but if you really love someone you want to be their last first kiss. Kissing can be a nerve wracking experience for a lot of people. This guy says it’s the moment when a woman decides if she will sleep with you or not. Harsh! But, it’s true. The first kiss in your life is the most important, and the following first kisses with each new partner needs to be even better than the last. You’ll not only want to kiss them like they have never been kissed before but in a way that they feel relaxed and connected. You want that person to forget everything else and their mind races off to another land (with you). How can you be their best kiss ever? Kissing is a science that’s fun. So, learn all you can about how your partner prefers their lip lock and master their kissing style. It is work but it’s also common knowledge people are more likely to be connected to you and feel attached if they feel that instant chemistry with you. You might have to experiment a little bit, but since kissing burns 6.4 calories a minute, so it’s a fun way to work out and learn how to be a pleaser. Fortunately, exploring astrology and their horoscope can help you with that. Since some zodiac signs are born to love (Leo, Scorpio, and Pisces) you really don’t know if the person you are kissing has had a lot of practice — on people or pillows. And every zodiac sign has their own unique way of kissing, from soft pecks to an open French kiss. A few zodiac signs are born more passionate while others approach intimacy in a methodical or mechanical way, with hands moving and some without. A few horoscope signs like kisses that are wet (ahem, water signs…hello…) and want more saliva and others, maybe earth or air zodiac signs, do not. Some want to hear words while being kissed, (Gemini) meaningful and others like to be playful, Aries. See, it also depends on a person’s zodiac sign. 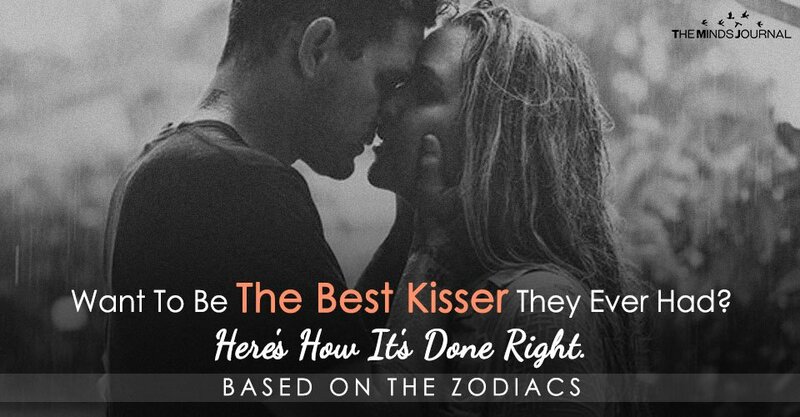 We’ve ranked the zodiac signs who love to be kissed most to those who may be more shy kissers. Scroll down to find out how each zodiac sign likes to be kissed, and how you should kiss the one you want, depending on Sun sign compatibility, using astrology! How could the most sexual/sensual sign of the zodiac not top this list? Scorpios are full of passion and sexual energy. Scorpios, being the most venomous and sexual sign of the zodiac, are penetrators. If they can’t do it with their stingers or their…other stingers…they’ll just use their tongues. Literally, they will penetrate your throat with their tongue. Make sure not to bite down on their tongues when it happens.